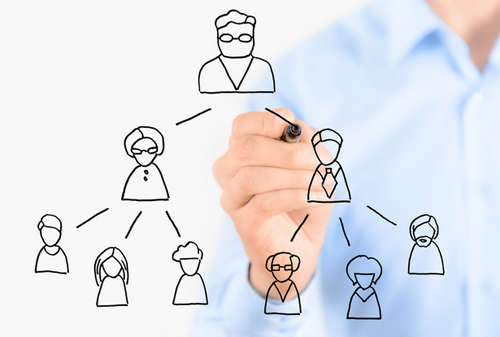 Multi Level Marketing or MLM schemes are known as referral marketing or network marketing scheme, where products or services are offered on a one to one basis by a sales person of the MLM Company to the end consumer instead of using traditional distribution channel (Distributors-retailers-consumers). These sales people in Multi Level Marketing are known as participants or independent business owners or associates or independent agents. They are authorized by the MLM scheme company to distribute company’s product or services to the end consumer. Sale process in MLM scheme begins with sales person’s friends, family members and relatives, which is why it’s also known as word of mouth marketing or relationship marketing. Multi Level Marketing scheme companies instead of spending money on advertisements, uses this root to market products or services. Generally, registration to these MLM schemes is free but to start with a minimal upfront investment usually a few thousand rupees or less is to be paid for the purchase of a product sample kit. Company’s sample kit gives you the opportunity to sell the product line directly to family, friends, relatives and other contacts. After buying a sample kit, they ask you to recruit other sales representatives those who can be from same family members, friends and acquaintances. These sales representative recruits constitute your ‘downline,’ and their sales generate income for you. This means, in addition to your own immediate retail profit from customers, which is based upon the volume of products sold through own sales efforts, you also get compensation based on the products sold through your sales person in the downline organization. When this process continues, your downline organization can lead to hundreds or even thousands of people. In the “downline” whoever gets recruited becomes part of your downline organization, generating income for them as well as for you. Similarly, if you have been recruited by some other sales person then you will be in downline organization of that man and commission earned by you will be shared by him and/or his upper layer representatives. In these types of Multi Level Marketing scheme businesses, it’s always better to be on the upper layer of the organizational hierarchy as commissions earned by downline persons will always be shared by upper layer sales persons. In such type of MLM schemes, retail commission is low compare to a direct sale business because available commission is directed towards the upper layer in the sponsor tree of the company. Some companies use multi level marketing or MLM scheme to exploit members of their networks and constitute illegal MLM pyramid schemes. If you are getting into MLM scheme then do some research to determine whether the company is a best suit for you or not and not a get rich quick scheme or pyramid MLM scheme. To identify the type of scheme you need to look into the compensation plan of the scheme. If the company has offered a scheme where you will get commission for recruiting new distributors then pause for a moment and start investigating. Because, plans that pay commissions for recruiting new distributors inevitably collapse when no new distributors can be recruited. This is something similar to Pyramid Scheme. In a pyramid MLM scheme which is also known as money game scheme, there is no product involved. Older participants will be paid from the money that is invested by new participants, just money changing hands. If such Multi Level Marketing scheme has products then that will just be to disguise the money game. In a pyramid MLM scheme, to make money some one else has to lose money. Recently RBI has cautioned the public against Multi-level Marketing (MLM) activities which promise easy or quick money upon enrollment of members. RBI also stated that income under such schemes majorly comes from enrolling more and more members from whom hefty subscription fees are taken rather than from the sale of products they offer. It is incumbent upon all members to enroll more members, as a portion of the subscription amounts so collected is distributed among the members at the top of the pyramid. Any break in the chain leads to the collapse of the pyramid, and the members lower down in the pyramid are the ones that are affected the most.